The officer used a stick to pull the alligator out from the under the SUV. Do alligators like shopping? Well, one may have been a fan as it was found hiding in the parking lot of a grocery store. A video shared by Florida's Sarasota County (FL) Sheriff's Office on Facebook shows a bunch of brave officers wrestling the agitated four feet alligator. They were eventually successful in capturing the reptile. "Here's a video of Sgt. 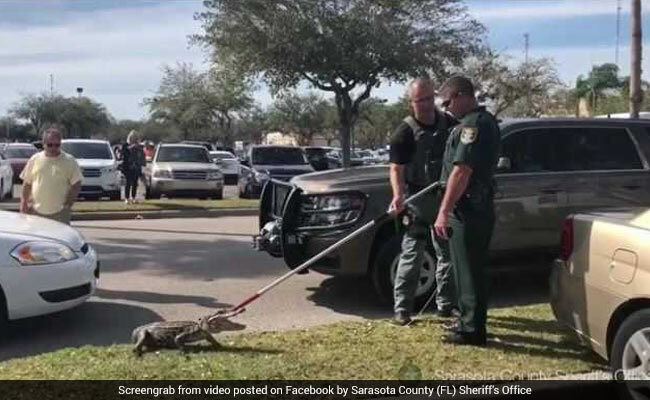 Mark Tuls and Deputy Lincoln Dilling protecting Sarasota County residents from a 4' gator who found his way to the WinnDixie parking lot on Fruitville Road," says the post shared along with the video. The alligator was found hiding under an SUV in the busy parking lot of the grocery store. You can even see someone sitting in the vehicle while the officers did their job. The clip shows an officer using a stick to pull the alligator out from the under the SUV. The creature puts up a fight for a few seconds before officers successfully capture it and put the reptile in the back of the police car. The alligator was later relocated to a water-body in the eastern part of the county. Since being posted the video has collected over 3,200 reactions and more than 2,600 shares on Facebook.